I will split this feature into two parts. 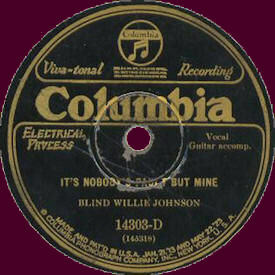 Initially, all the songs that Johnson later recorded (sometimes under different titles) will be listed and discussed briefly to illustrate a chronological sequence in the form of date of issue (or not as the case may be). Part 2 will consider in more detail any possible influences on Blind Willie via the melody, vocal style and lyrics. References to relevant recordings made after Johnson’s will appear from time to time, in both Parts 1 and 2. Finally, in the summary I hope to conclude that there were indeed quite substantial number of songs and artists who influenced the Texas bottleneck guitar ace, forming an important factor in the roots of Blind Willie Johnson.